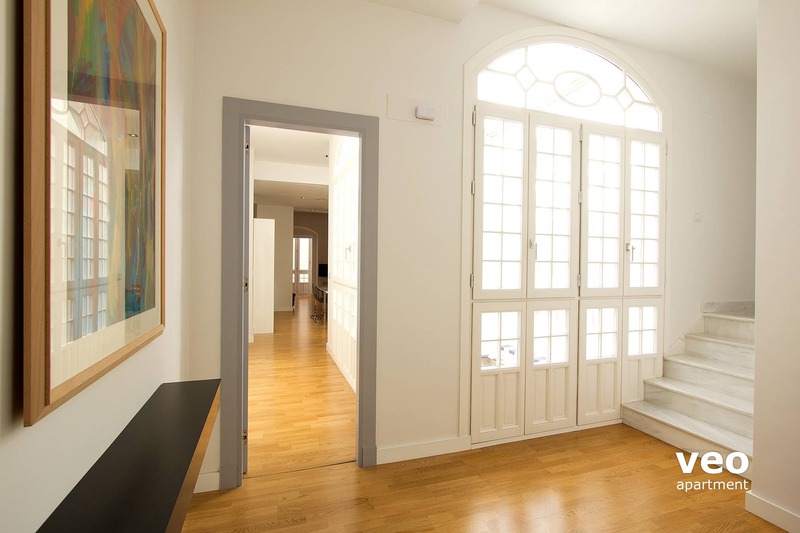 Lovely 3-bedroom apartment for 6+2 guests, occupying the whole of the first floor of a typical Sevillian house. San Vicente neighbourhood. Huge windows overlook the building's central patio and infuse the apartment with light. 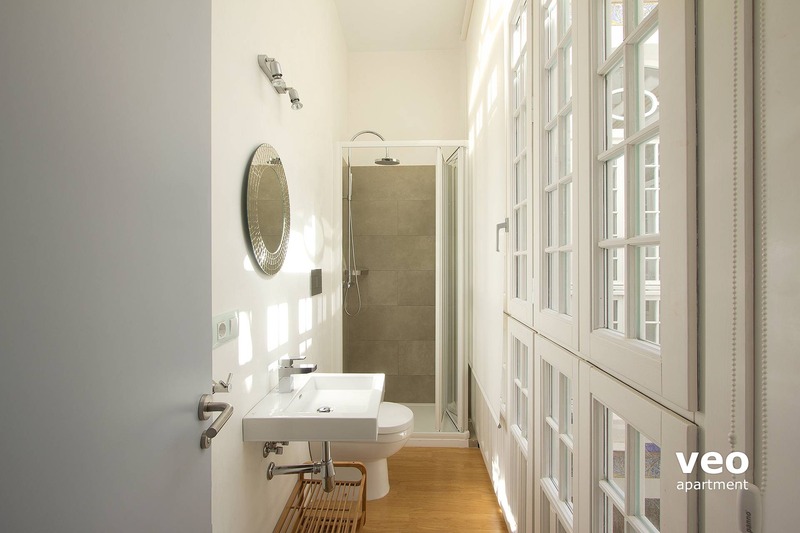 From the apartment entrance, to the right of the patio and with windows overlooking it is a double bedroom and en-suite bathroom. 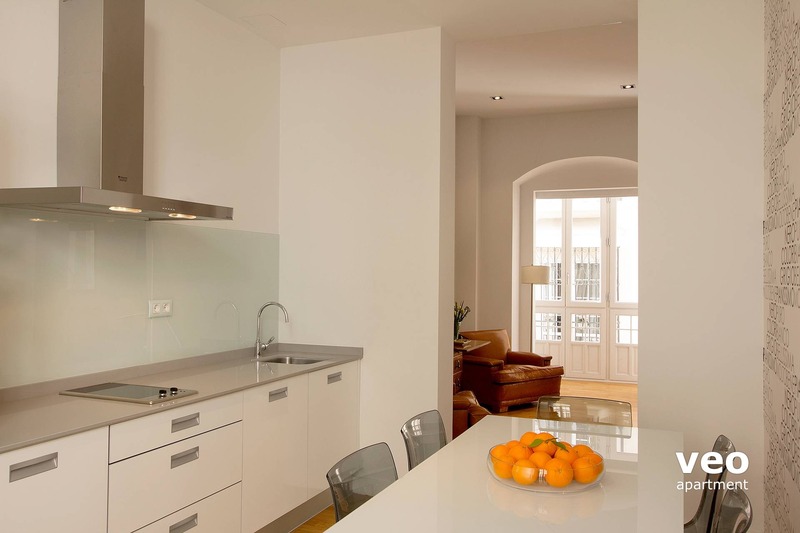 Also to the right of the patio is the contemporary kitchen with a dining table and seating; and beyond is the spacious living-room, lit by a large wooden bay window - the classic Sevillian "cierro". 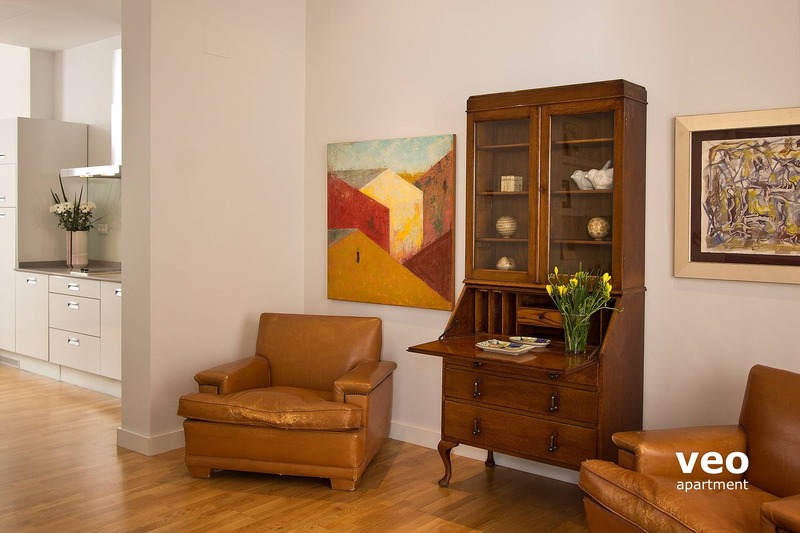 There are two leather arm chairs and two sofas set around a central glass coffee table. One of the sofas can be transformed into a bed to sleep two guests. 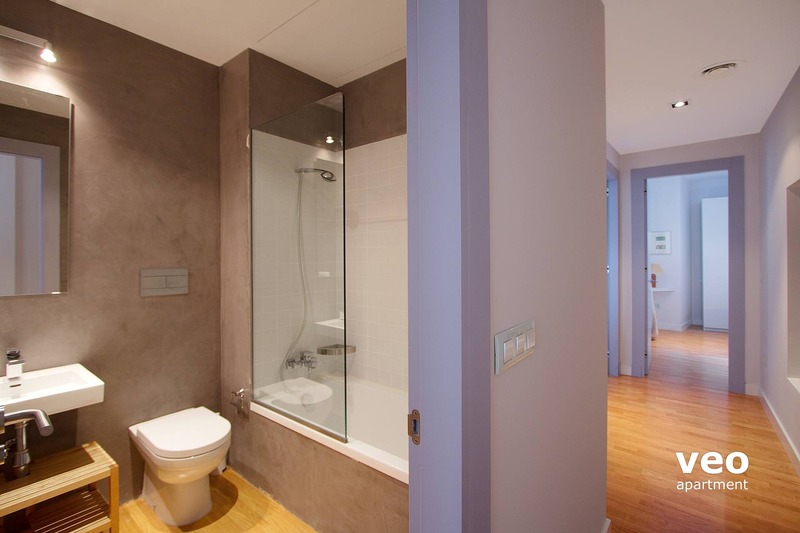 To the left of the entrance hall is a separate bathroom, which includes a bath; and two further bedrooms. One with twin beds placed together and the second with a double bed. 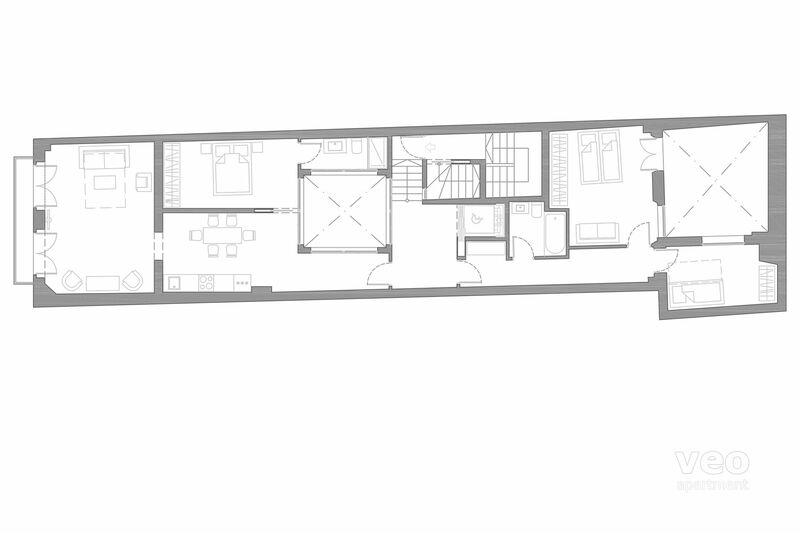 The two bedrooms overlook a second, smaller interior patio of the building. 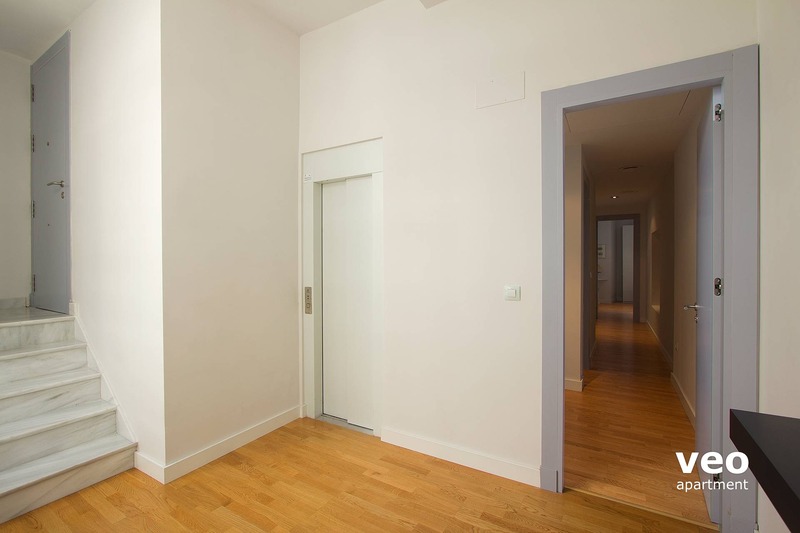 The apartment is of exceptional quality and finish, with wood flooring throughout and includes access directly inside by elevator. San Vicente is a residential neighbourhood notable for its many squares and churches, located in the northwest of the historic centre. 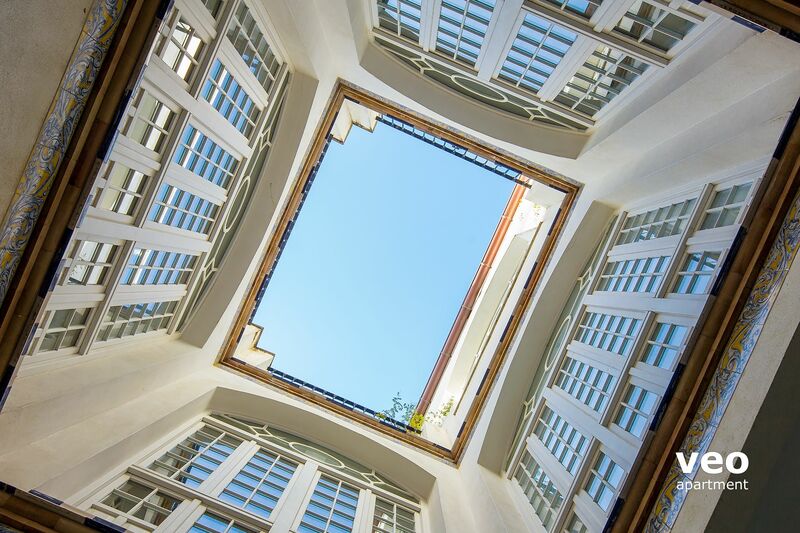 Minutes from the major sights and attractions, it makes an ideal base to explore an authentic part of the city and enjoy some of Seville's most renowned local tapas bars. Historic churches worth visiting are San Vicente - a fine example of gothic-mudejár architecture built during the 15th century – and the Basilica del Gran Poder, home to one of the most revered and famous images of Christ in the city. The procession of the "Cristo del Gran Poder" is a quintessential part of Holy Week in Seville. San Vicente is bordered on the west by the Guadalquivir River and the riverside is popular for walking, cycling and running. "Plaza de Armas" (also named Estación de Córdoba), formerly Seville's main railway station, is now a modern-day shopping centre yet still retains its 1901 neo-mudejar exterior and the steel architecture of its industrial past. San Vicente The Fine Arts Museum, Guadalquivir River and Alameda. Monasteries and churches. Upon arrival, you will be required to pay a refundable security deposit to cover any damages, etc. For this apartment, the deposit is: 100 €. Reduced rates at car park "Plaza de la Concordia". Located at 300 m from the apartment. Reservation by email required. Das Apartment wir als Ausgangspunkt sehr gut für die Stadtbesichtigung gelegen. Bei unserer Ankunft hat uns ein sehr freundlicher Mitarbeiter der Agentur empfangen und hat uns gute Tipps für unseren Aufenthalt gegeben. Zum Apartment haben wir keine Beanstandungen; es wurde von uns so angetroffen, wie es im Internet präsentiert wird. Fazit: Sevilla hat uns sehr gut gefallen und ist sicher eine Reise wert. Ein tolles Ziel für die Herbstferien bei 30-32° Grad Sonne. Einfach schön. 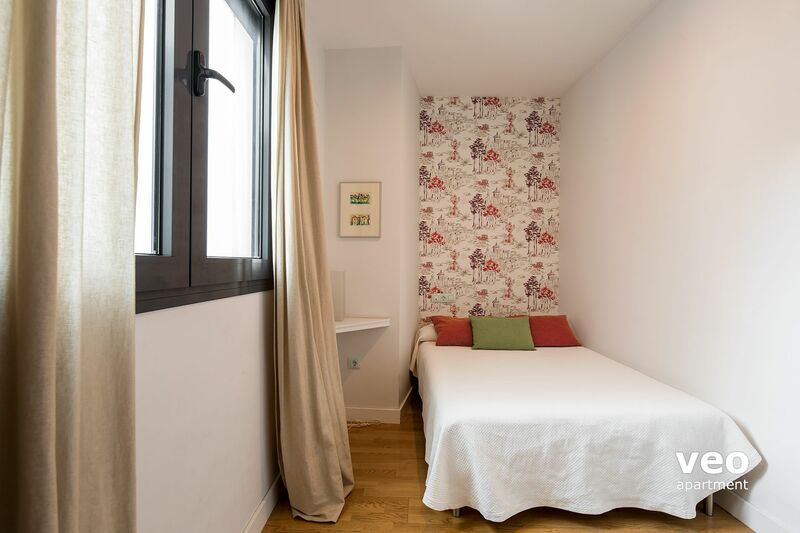 "Bel appartement pour un séjour à Séville"
Appartement calme, bien situé pour visiter Séville. Belles prestations. Bonnes literies. Parking public, commerces, restaurants à proximité. A réserver sans hésitation ! 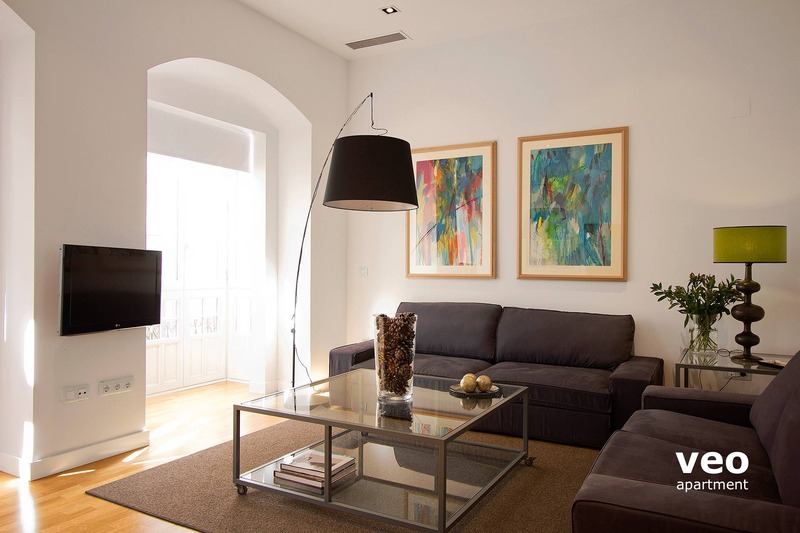 "Beautiful apartment in the heart of Seville"
Great apartment, spacious and clean at 20 min from the Cathedral and the Real Alcazar. Beds are super comfy. Plenty of delicious restsurants around for a bite to eat. Corte Ingles 5 min away for grocery. Veoapartment staff is very welcoming and give us a lot of suggestions for things to see and go. I would definitely use them again ! 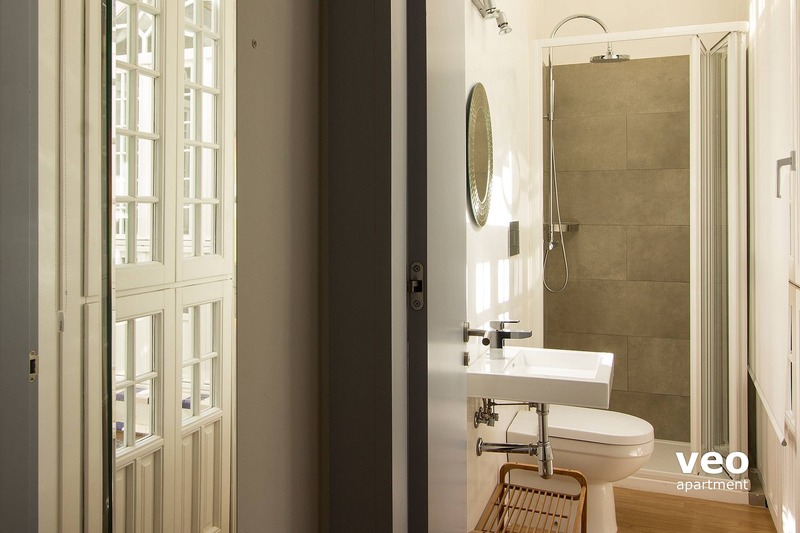 "A large and very comfortable apartment in an amazing, authentic part of town. " 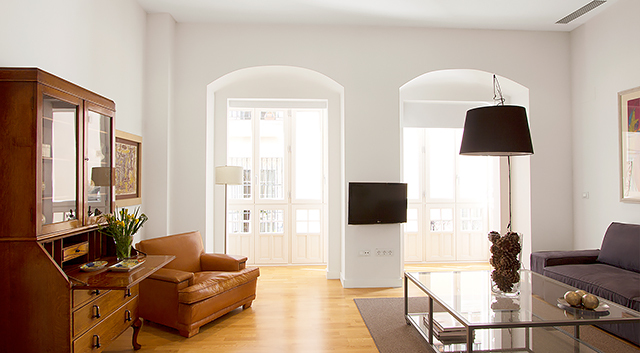 We thoroughly enjoyed our stay in this wonderful apartment. It generously catered to all our needs. We loved the surroundings and it's proximity to so many wonderful major attractions in Seville. "Berrio céntrico con todo lo necesario alrededor "
Great location and a very well equipped apartment. 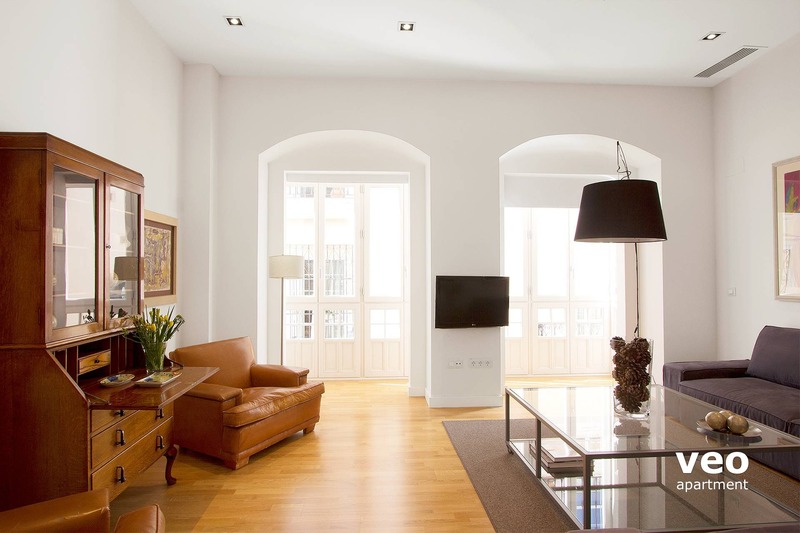 "A lovely week in Seville"
This apartment is beautiful and spacious. Una estancia perfecta!! El apartamento precioso y agradable!!! y muy buena situación!!! Muy recomendable!!! "Appartement sympa dans un quartier agreable"
Apartamento muy céntrico y moderno. 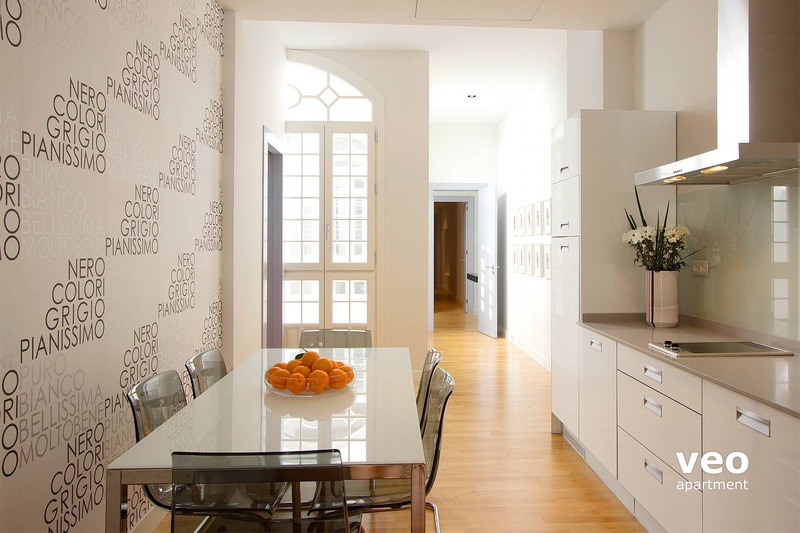 "Nice and well located family apartment"
Well located apartment in the old city, close to the lovely plaza San Lorenzo (nice for an early breakfast in terrace), Museo de Bellas Artes and the shopping areas. Quiet, clean and big apartment built around a small patio - and excellent A/C, mandatory in summer! Nice address that we would use again for another trip. Top appartement ! 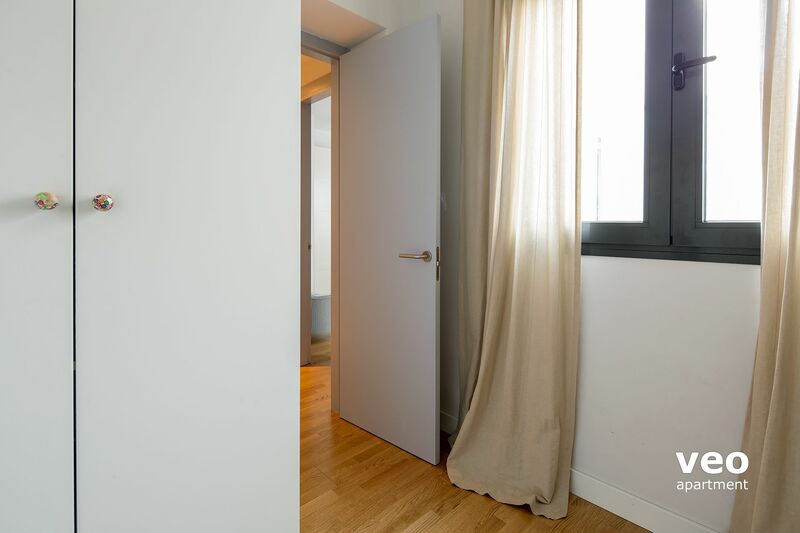 Si on a besoin de serviettes ou draps supplémentaires, le propriétaire fait son necessarie pour satisfaire les locataires et ça c'est très appréciable !!! Merci pour ça ! Had a great stay, we had some noisy neighbours (also guests) but Sophia handled it very well. Nice location, close to the Alameda Hercules and on walking distance from the town centre. For the rowing course it's nice to have a bike but walking is possible. 20-30 minuits depending on your pace. "Comodo, agradable decoracion con obras de arte increibles. Gracias a Maria." "Great spacious apartment in wonderful location." Spacious well appointed apartment to suit a large family or group. 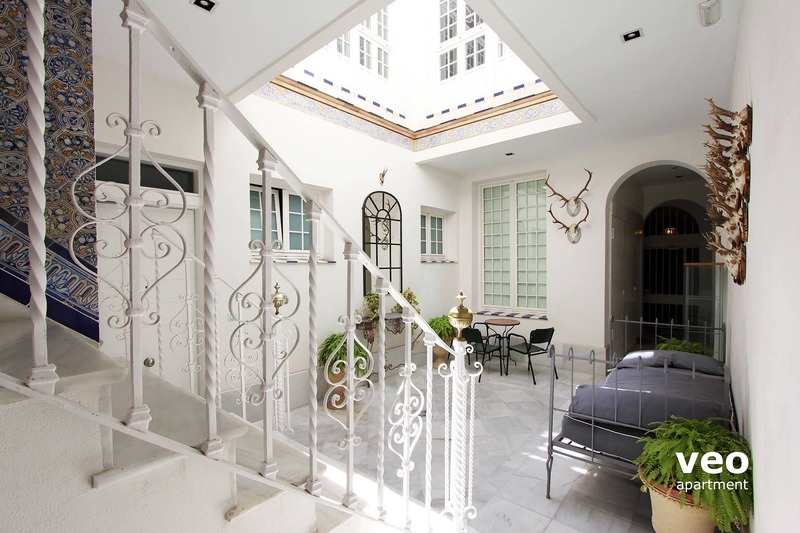 Conveniently located in Seville not far from main sites and shopping streets. Many local bars and restaurants nearby or within walking distance. "Bel appartement sevillan, bien situé et calme." Parfait pour 6 personnes, beau, spacieux et agréable, quoique cuisine sous équipée pour préparer des repas. 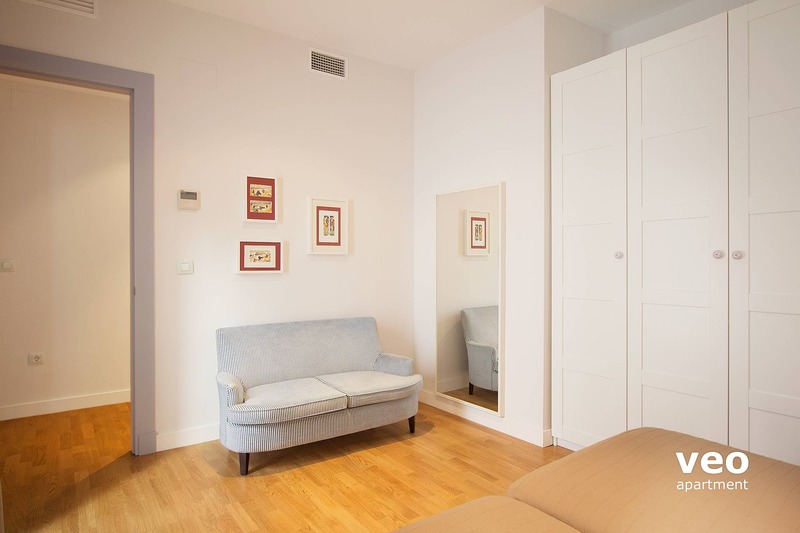 "Beautiful apartment and well equipped, good location and friendly responsive service"
Appartamento abbastanza centrale, spazioso e silenzioso. Nos ha gustado mucho tanto el apartamento como la zona en la que se encontraba. "Très agréable et bien situé"
Cet appartement est très agréable et bien situé. Lumineux, décoration simple et de bon goût, literie excellente (on est assez difficile sur ce point), rangements suffisants. Les salles de bain sont correctes (manque de pression d'eau parfois). Le coin des "enfants" (2 chambres) est assez éloigné de la chambre parentale avec une porte de séparation en plus. Impeccable pour les ados, ou pour deux familles. Chacun son coin. Seul point négatif, la terrasse et la piscine de l'appartement du dessus donnent directement dans le patio tout comme l'appartement. Selon que les voisins sont bruyants et/ou nombreux, cela peut rapidement devenir gênant. Nous avons pu quitter l'appartement à 17h au lieu de midi car les locataires suivants n'arrivaient que le lendemain, ce qui est très appréciable. Point de vue commodités, un café au coin de la rue permet d'aller prendre son petit déjeuner. Boulangerie et fruitier également à 2 pas. Petit supermarché Dia à 2 minutes. Nous recommandons aussi, juste à côté, un petit restaurant (El Panduro) dans lequel nous sommes entrés par hasard le premier soir et auquel nous sommes retournés diner 3 fois ! C'est là que nous avons mangé les tapas les plus raffinés de notre séjour. Enfin, localisation parfaite. Tout se fait à pied. Le quartier est propre et un peu animé mais la rue reste très calme, donc pas de bruit. "Beautiful , light airy apartment , well located but out of touristy areas." Pepi was delightful even with the language barrier.She organised taxis for our return. Apartment ideal for families with young adults or teenagers , as it is effectively split into two sleeping areas. Good spot, would've been nice to have a few comforts after travelling so far eg coffee sachets, sugar, oil for cooking, washing powder for clothes and maybe some information of Seville and places to visit. 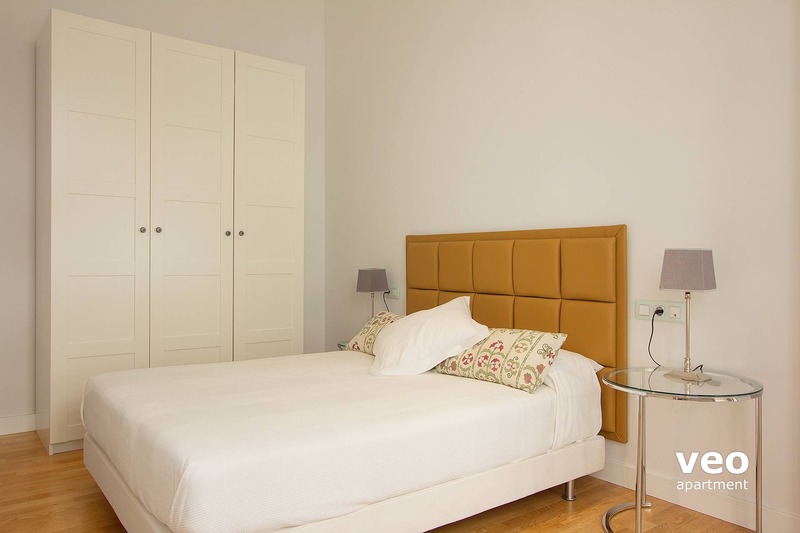 "Perfect, spacious, comfy and stylish"
the apartment is in a quiet street with varions tapas bars and great little restaurants near by. It is within a five min walk of a supermarket if in need of supplies. The area is lovely and untouristy yet a 15 min walk, if that to the cathedral area. The apartment itself is very spacious. The layout was perfect for us - a couple with a toddler waking early at one end of the apartment and two friends of ours, waking later at the other end. It would work well for any group operating on slightly different timescales. We found the beds very comfy too and the living room was a great place to relax at the end of a long day. The only thing I would change would be to have an extra tea towel for drying up and maybe instructions for where to put the rubbish out, but otherwise great value for money and we would definitely return. 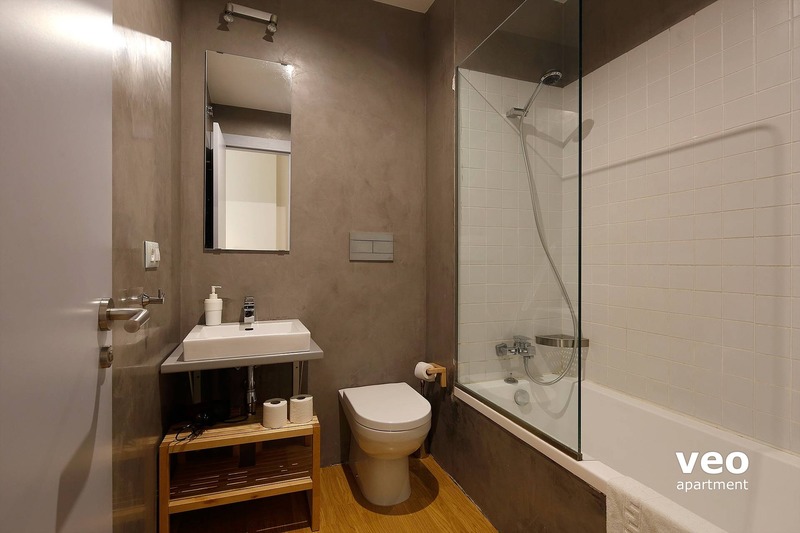 Veoapartment were very efficient and easy to deal with. "Très joli appartement, bien situé et calme." "Lovely, modern apartment with lots of light." areas of interest. There is a wonderful restaurant around the corner as well as fruit stores, bakeries and a supermarket within a block of the apartment. Cafés and banks within a block as well. "Appreciating style and much more in San Vincente"
We were initially unsure of this choice, wishing to enjoy the view from your Triana apartment but Teodosio 3 was just right. 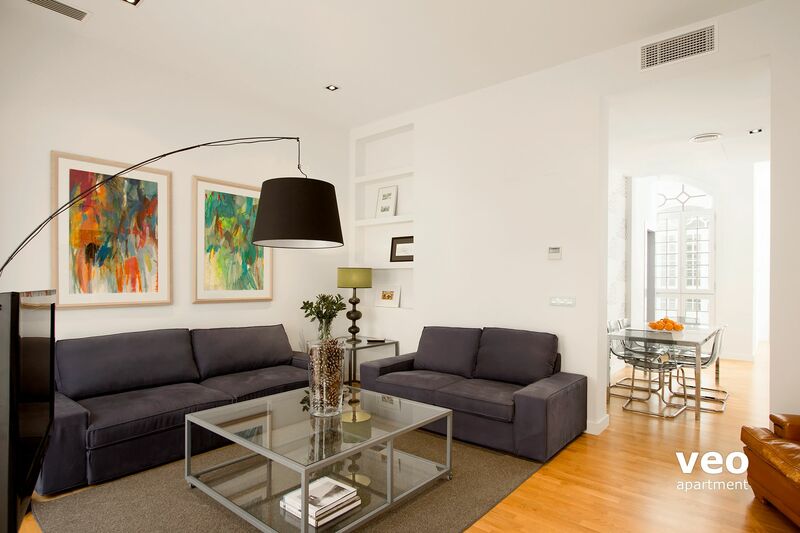 The apartment is as you describe elegant and bright and its location is great! 5 minutes walk from Centro but situated in a 'real' non tourist part of Sevilla. Dos de Mayo round the corner was fantastic for lunch time tapas and Casa Ricardo for delicious evening meals :) Plus local shops and a quiet location not far from the river. Really great location. "Sejour agreable dans bel appartement bien situé"
Appartement confortable personnalisé avec du charme manque d'une corbeille de bienvenue avec spécialités espagnoles ( fruits et gateaux ...). A relever porte d'entrée bruyante. "Gorgeous, modern apartment in lovely quiet location "
Great apartment, easy to find, 15 minutes walk from cathedral. Great tapas round the corner for tapas and beer. The apartment is wow and exactly as the pictures indicate. We were a party of five and there was plenty of space for us all. The beds were comfy, sitting room huge and kitchen stocked with the things you need. 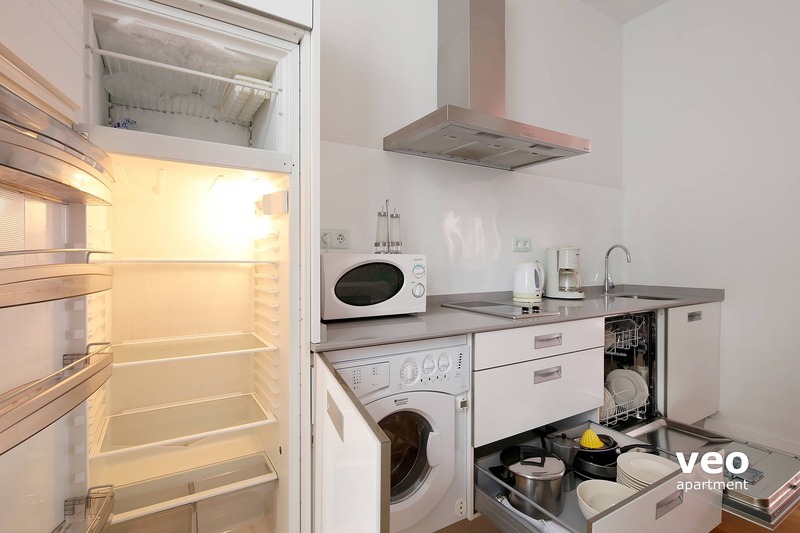 "Parfait, appartement conforme au descritifs et photos vraiment trés bien. ascenceur fonctionnel." Bien situé en centre ville, rue calme, cependant un peu bruyant lorsque les portes de l'entrée claquent le soir. Appartement bien décoré. Rien nà dire sauf un distributeur de savon défectueux (seule critique négative). 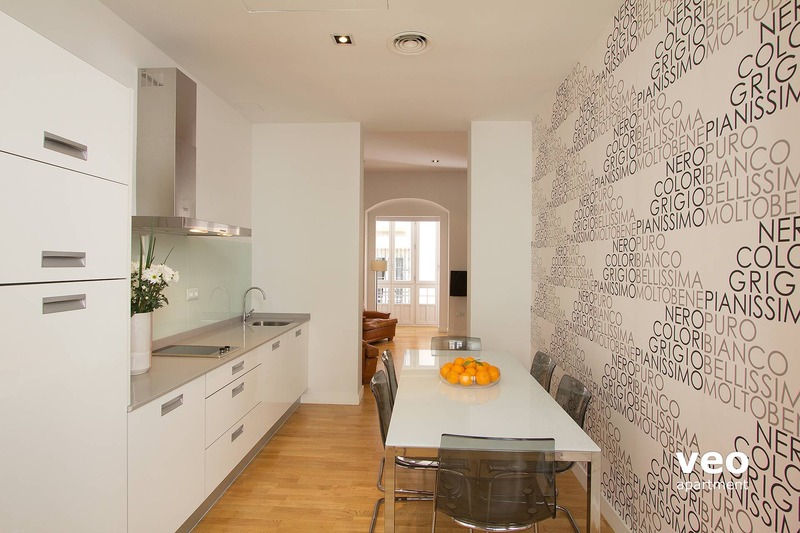 "A most perfect place "
All around terrific, spacious apartment in Sevilla -- from the early booking communications, pre-planning details, and on-site assistance upon arriving. Very impressed with the apartments location and access to restaurants, bakery, parking, fine arts museum, and so much more! We walked to all the Sevilla major sites from Teodosio. It was nice to have laundry facilities and comfy beds. The only challenge we encountered was upon our approach while driving a van on the narrow streets. If you are looking for a quiet convenient place along with feeling apart of real neighborhood - this is the place! 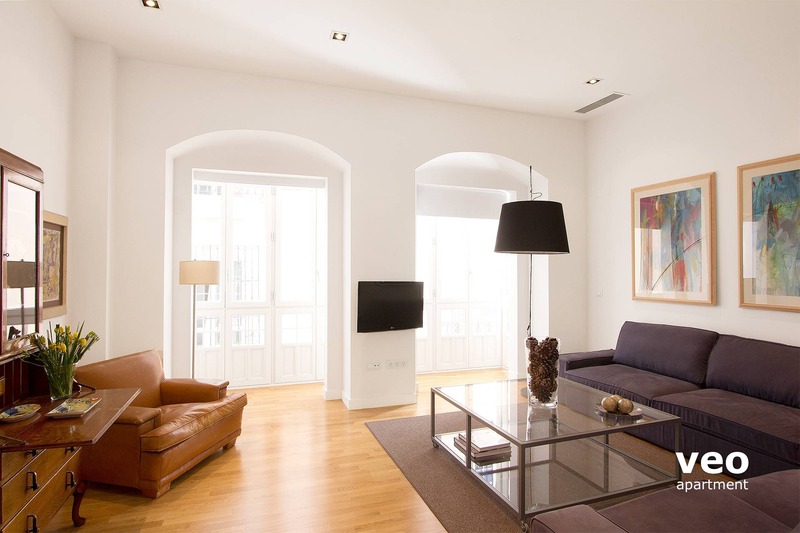 Fantastic apartment, well located in Seville. Lots of good tapas bars nearby, and 10 min walk to the centre. There were 6 adults and a baby in our party, and there was plenty of space for all of us. The apartment is clean, modern and well appointed. This was the perfect location for us. Our daughter had just finished a semester as a student at the Center for Spanish Studies and lived in their residencia which was right around the corner from this apartment. So it was fun and convenient for us to live in her Seville neighborhood. The street is quiet and still very close to everything we wanted to see. The apartment is beautiful and very clean. The elevator was handy for carrying our luggage in and out of the apartment. An extra bonus was the doors that can close off the different ends of the apartment. My husband and I stayed in the bedroom near the living room and kitchen. Our young adult daughter and son stayed in the other end. Because we were sometimes on different schedules we could close off the doors so it was even more quiet so everyone could sleep at different times. The veoapartment service was excellent. When we arrived we were met at our apartment and shown where everything is. At one point we needed extra towels and they were delivered right away. "Quelques jours de bonheur à Séville"
Appartement magnifique, idéalement situé pour la visite de cette ville superbe. Accueil trés chaleureux de Sofia qui nous a indiqué quelques adresses de restaurants et bars à tapas. Notre séjour fut trés agréable à Séville dans un appartement irréprochable sur tous les points (linge de maison cependant un peu limité). Une adresse à retenir et à conseiller assurément. "Lovely apartment in excellent location"
This worked really well for a family of 4 adults and 2 teenagers. The location was charming and characterful. We had a problem with the electricity which was resolved within an hour or two. 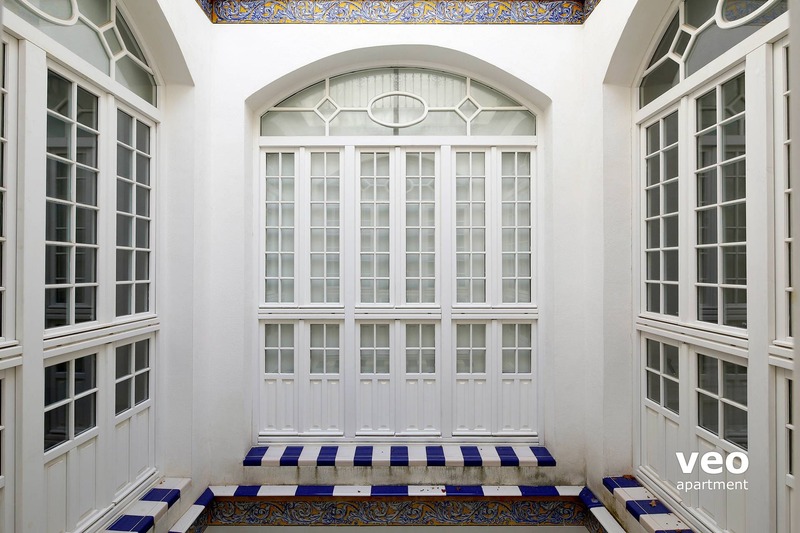 "A real surprise in the heart of Seville. Stunning apartment, perfect location with a great bakery and pub just around the corner." Excellent. All of our requests were looked after even down to getting us a kettle which we really appreciated. "The Rolls Royce of Apartments"
Beautiful, spacious apartment in good location - close walk to main attractions but quiet street. I am aware that we arrived one hour later than expected and Sofia was not available to give us the keys but the information provided by her substitute was very limited, the only thing she did was to switch the lights on and collect the payment. No further advise on how to work the washing machine, where to empty the bin or any other useful info about the area was given to us. Also, the headboard in one of the bedrooms fell on my head whilst asleep and the en-suite bathroom had a small leak under the hand basin. Excellent location and a great apt. We spent 4 nights and it was a pleasure. There was plenty of room for 6 adults. Easy walking to the plazas, el centro, and shopping. 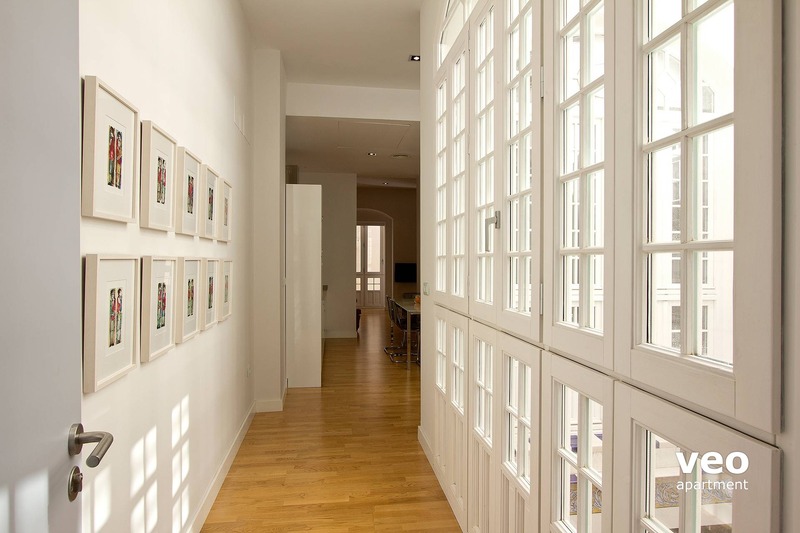 I would surely recommend this apt, and when coming back to Sevilla check availability.